When I sell patterns, sometimes I like to include a coloring sheet. 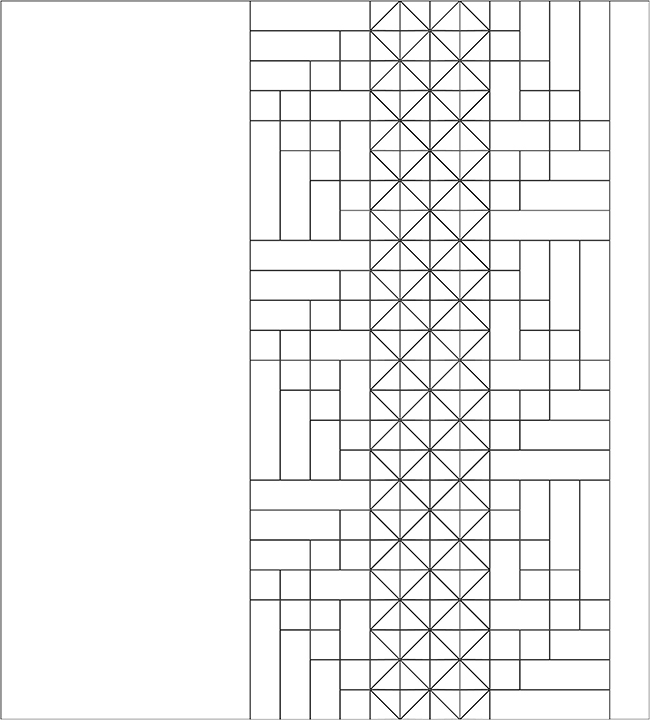 Basically, it’s a page size quilt top layout in black and white, without the patches colored in. This allows my customer to color the quilt the way that they will be sewing it, to make sure that they like it before they start, to try out other options, or simply as a guide to avoid confusion! If you do not sell your EQ8 designs, you still might find it helpful to print a coloring sheet or two. With the summer coming up, it might be more appealing to bring a coloring sheet and your colored pencils to the pool to recolor designs, rather than sitting at the computer. If you have younger kids, you can sit at the table and color with your kids. Once you settle on a coloring scheme, you can always mock up your final version in EQ8 quick as a wink during nap time. 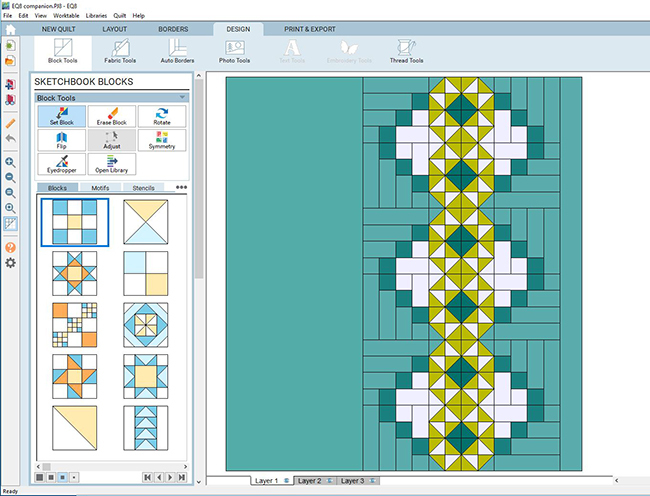 To start, open your quilt project in the Design tab (up on the top of the page). I am showing the quilt top here that I used for the new book, EQ8 Designing Quilts: Quilt Design Tricks from EQ8 Experts. 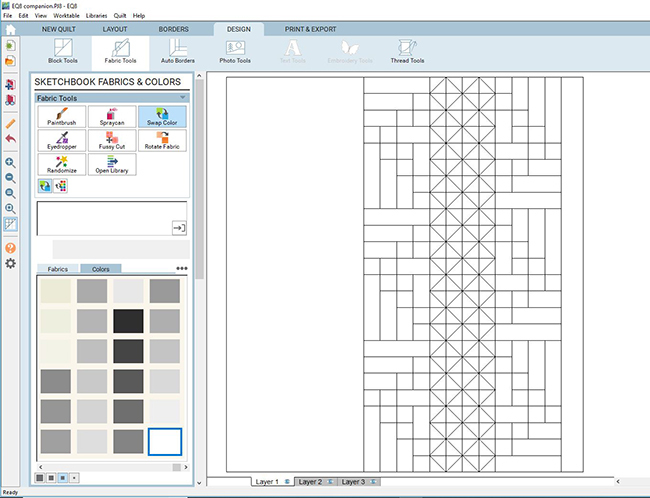 Next, click on the “Fabric Tools” button. 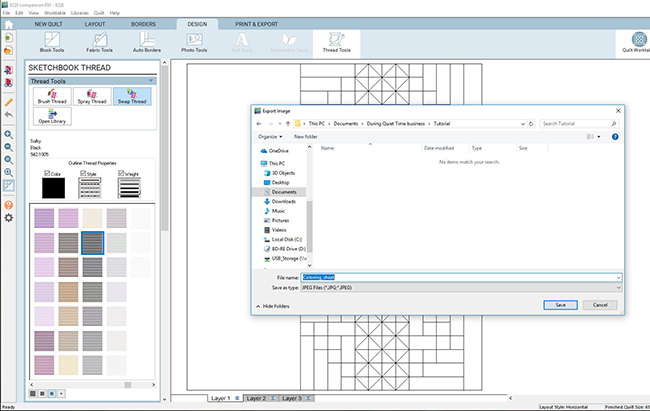 Select the color white from the color squares in the lower window. Choose the “Swap Color” button. 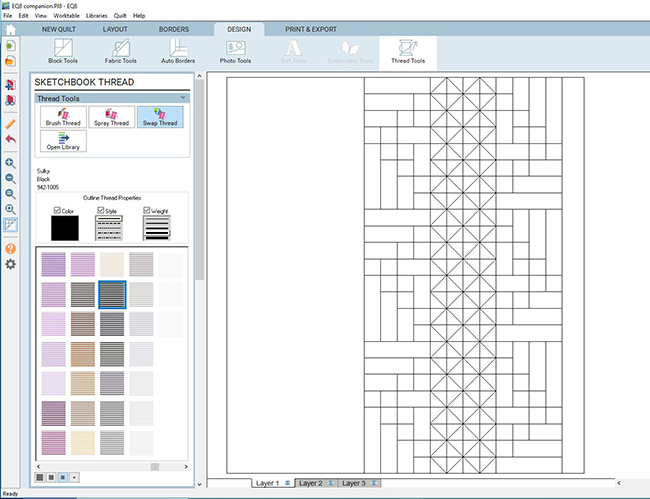 Click on each of the colors in the design, turning the entire quilt top white in just a couple of clicks. I like to make the lines a little darker next, using the “Thread Tools” selection on the Design menu. Under thread properties, I changed the Color to black, selected a solid line for the Style, and chose the 4th weight selection. 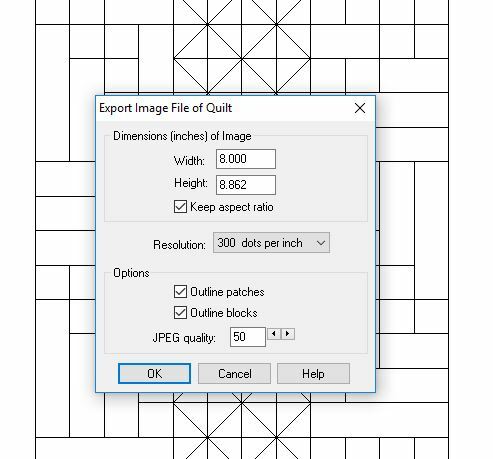 Then I clicked on the “Swap Thread” button and clicked on a single line on the quilt top diagram to make all the lines more bold. Now, under “File”, select “Export Image.” Save the file to a folder on your computer and title it Coloring_sheet.jpg. You want to make sure that the boxes for outlining patches and blocks are checked. This is what your final image looks like. You can print it and you are ready to color!